Three quick things, then on to the reviews. First things first, the Kindle version of Light of the Diddicoy is now available! Yay. If you're interested, it can be purchased here. 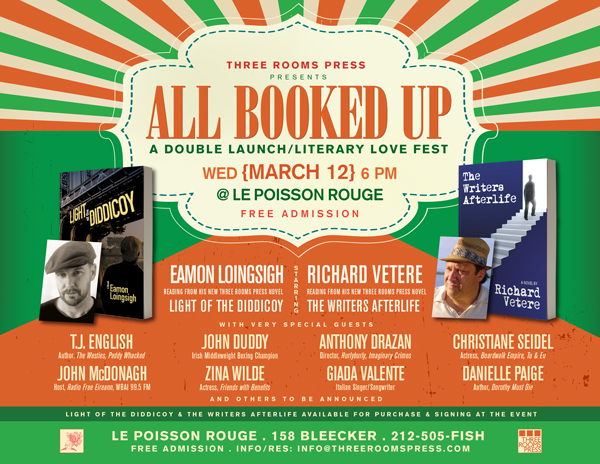 John Duddy (right) will be reading from Light of the Diddicoy Wednesday night, 3/12/14 at Le Poisson Rouge. Secondly, as many of you already know, March 12 is the release party for Light of the Diddicoy along with famous playwright and fellow Three Rooms Press author Richard Vetere's book The Writers Afterlife. There will be many famous people on stage with both Richard and myself, including journalist & author TJ English, author of Paddy Whacked and The Westies. Also, we will have what Irish Central calls the third most handsome Irishman, John Duddy, who was a former Middle Weight Champion boxer of Northern Ireland and current actor in Colin Broderick's very interesting play, Father Who. Also in attendance will be John McDonough of WBAI Radio-NYC, host of Radio Free Eireann and beautiful actress Christiane Seidel of Boardwalk Empire along with many, many more. If you're in town, don't hesitate to come, IT'S FREE! Finally, on March 7, I read at the Dire Reading Series at Out of the Blue Art Gallery in Boston and had a great time and sold quite a few copies of Light of the Diddicoy! Well, the word is certainly getting out and I feel blessed that it's a good word. Quite a few reviews have come out and it seems people are enjoying Light of the Diddicoy. As previously mentioned, the Irish Echo & Wild Geese both had very positive things to say and the piece written about why Light of the Diddicoy was written, according to its webmaster/raconteur at LitKicks, received lots of traffic. 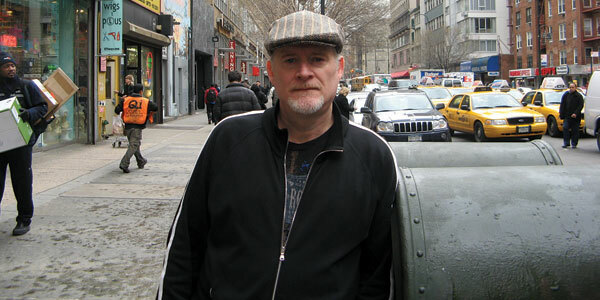 "A vivid portrait of the hardscrabble world of Irish gangs along the Brooklyn waterfront from Greenpoint to Red Hook in the early 20th century, the author captures the still emerging metropolis and its characters through the eyes of wide eyed Irish immigrant Liam Garrity." "Loingsigh’s book looks at a fascinating lifestyle drawn from his extensive research and his own family history. The plot builds and climaxes well, with tension maintained. Though the drama is constant, it allows moments of appropriate reflection." "Loingsigh’s narrative owes much to historical accounts and family lore; he easily evokes the poverty, pain and hard labor that made up the working experience of the immigrant class in early 20th-century New York, giving the story a grimy verisimilitude." Author & TV personality TJ English will highlight the night and will be doing introductions as well. A big "Congratulations!" to you on this, Eamon. Hope to see some photos from the night and a summary of how things went. Congratulations, Eamon - looking forward to reading this soon!